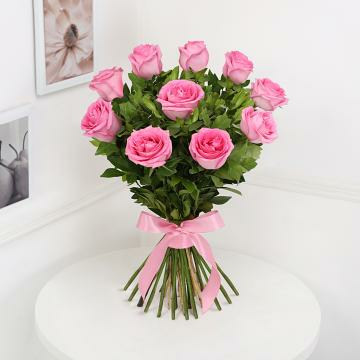 Nothing can better express your heartfelt feelings and emotions than this delightful bunch of 10 pink roses. This arrangement of freshly plucked roses exudes a special fragrance which is sure to last for longer duration of time. This item in Flowers & Bouquets category was first added to our catalog on 04-01-2018. Buy Beautiful Bunch of 10 Pink Roses, sold & shipped by IGP India where you can shop online for Send Cakes, Flowers & Gifts to India - Anytime/Anywhere. This Flowers & Bouquets collection has been tagged as gift to india, birthday, anniversary, valentine day, mothers day, fathers day, send gift from usa.